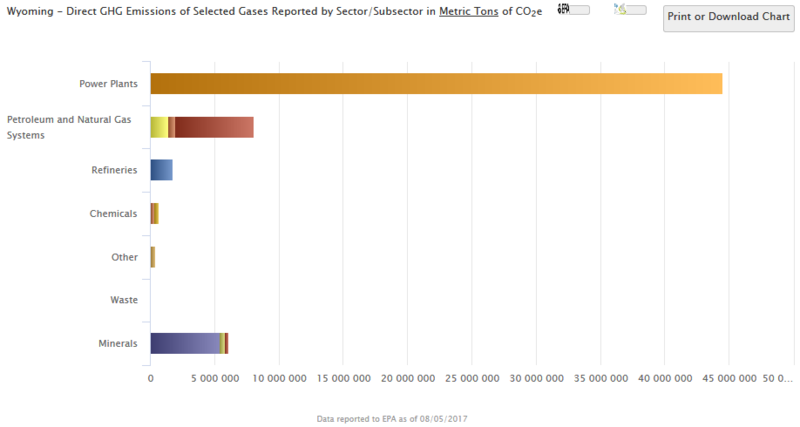 Why is the per capita CO2 emissions so much higher in Wyoming than in the Northeast? 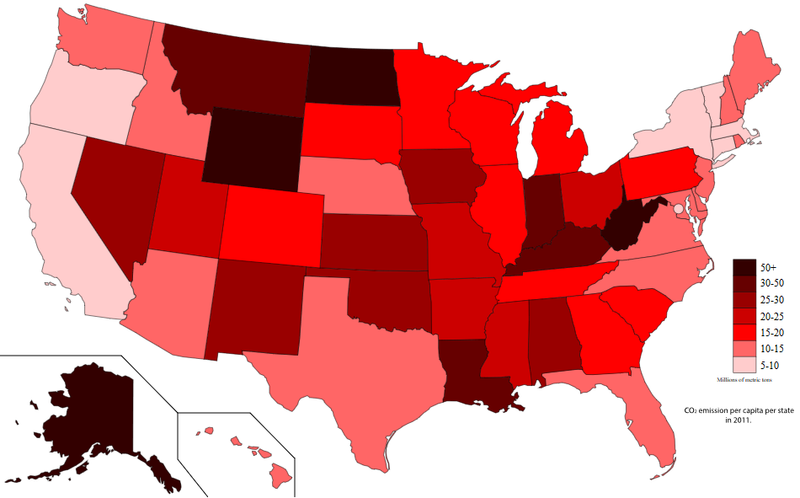 Per capita CO2 emissions are several times higher in the "red" states of the West and South than it is in the Northeast. I cannot imagine why. This question came from our site for those interested in the geology, meteorology, oceanography, and environmental sciences. tl;dr - Comparing Wyoming to, say, New York, the largest source of CO2 emissions in both states is the power sector. Wyoming uses mostly coal for power, which emits more CO2 per kWh generated than any other source, while NY uses a mix of mostly natural gas, with nuclear and hydro. Additionally, Wyoming exports power (increasing emissions counts) while NY imports (reducing emissions counts). Finally, the average Wyomingite uses about four times the power of the average New Yorker, possibly due to higher participation in industry. 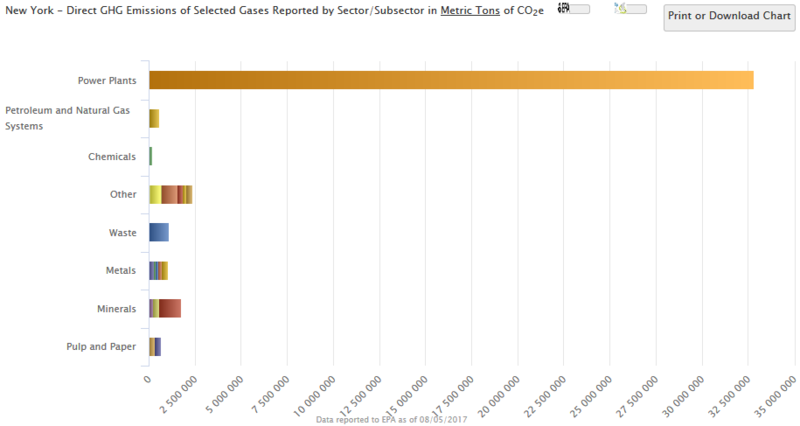 Using the EPA's FLIGHT database (Facility Level Information on Green House gases Tool -- a terrible, terrible acronym) I compared Wyoming to New York, being the largest state in the Northeast (geographically and by population). All data throughout this post is for 2014 to match the map in the question. Because coal-fired generation emits CO2 at about twice the rate of natural gas-fired generation, we start to see why Wyoming's emissions are so high. New York's emissions are limited by its reliance on hydro, nuclear, and less carbon-intense natural gas. The disparity here is massive. A few things explain this. First, on a per capita basis, Wyoming generates 10 times as much power as New York: Total generation for NY in 2014 was about 138 TWh, or about 7,000 kWh per person (population of around 20 million). In contrast, total generation in WY was about 50 TWh, or about 85,000 kWh per person (population of around 0.5 million). However, that doesn't directly correlate to what each person uses. According to EIA's electric sales data, total sales of electricity in NY were 147 TWh, compared to in-state generation of 138 TWh. This means that 11 TWh, or about 7.5%, of the power consumed in NY was produced in other states (and some in Canada). In contrast, generation in Wyoming totaled 50 TWh, compared to sales of 17 TWh -- meaning Wyoming exported 66% of the power it produced. Why does Wyoming use so much coal, while NY uses natural gas? Ultimately this has more to do with economics than politics. Coal is mined in Wyoming, so it's burned there. Natural gas is extracted in Pennsylvania, NY's neighbor to the south and west. Moving electricity is easier than moving coal, so it's burned where it's mined (especially lignite coal). In the northeast, natural gas is piped around for heating, so the infrastructure backbone to move it around for electric generation is already there. Hydro power makes sense in NY because of the abundance of freshwater. Nuclear power is prevalent in NY because when the U.S. was building nuclear power plants, there was a dense enough population in NY to justify this, along with abundant surface water for cooling, and a skilled workforce. Wyoming didn't have any of these, so the nukes were built in the Northeast. Recent trends in power generation sources have to do with politics -- NY is shutting down coal and nuclear and adding more wind and solar -- but the current state of affairs was brought about by the economics of cheap, abundant natural gas. The FLIGHT data at the top only includes point sources. In the transportation sector, Wyoming wins out. From the EIA's data on retail gasoline sales, the average New Yorker used about 94 L of gasoline in 2014, while the average Wyomingite used 29 L. However, at 2.3 kg CO2 per liter of gasoline, NY's total of 4.3 million metric tons of CO2 from gasoline still pales in comparison to the 34 million metric tons from the power sector. Good answer elsewhere that points out that Wyoming generates and exports a lot of coal source power, which badly skews the data. But let's just look at the more general question: Why does a Wyoming resident USE more energy than someone in a more urban setting? A high plains winter is no joke. Much of Wyoming still has several FEET on snow in mid May. This creates a high demand for heating fuel. Long winters also mean that 'carbon friendly' commuting (bike, walk, scooter, motorbike) has a shorter season, and that due to that shorter season is chosen by fewer people even when it is an option. Vehicles don't rust very fast. This encourages people to hold on to them longer. Older cars are less efficient. On top of that the low population, and more expensive transport will raise new car prices, further encouraging long term use. People drive more, compared to north-easterners. Where you are going is far from where you are. The low density also means that public transport system are either non-existant, or are low on convenience. A lot of Wyoming people are rural -- farm and ranch folk -- which makes this worse. Land is cheap. It's reasonable to own a quarter section 20 miles from town. High infra-structure costs per person. It costs the same to run a snowplow over a road whether that road is used by 20 people an hour or 300 people per hour. Roads deteriorate from use, (especially heavy trucks) but also from weather. Freeze thaw cycles are tough on roads. Which gases increase the greenhouse effect more than carbon dioxide? How much CO2 do those gas flame pits outside restaurants emit? How much CO2 do I cause with one Google search? How much could the US reduce its electricity demand if people moved from Texas back to Ohio? A more useful metric for greenhouse gas emissions reduction targets? How much increase in GHG emissions is caused by Amazon Prime? Which climate change mitigations take longer than 12 years to see a net benefit? Is burning wood the same as letting it biodegrade from a CO2 emissions perspective?